The 2015 Inspiration Award was presented to Mandy Harvey. 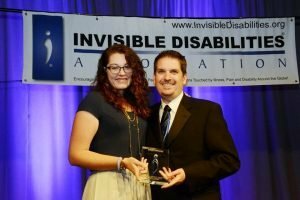 Mandy has been selected to be the 2015 recipient of the Invisible Disabilities Association’s “But You LOOK Good” Inspiration Award. Mandy has been chosen because as someone who lives daily with the silence of deafness; she inspires others in the midst of their challenges and triumphs. Mandy passionately shares her incredible vocal gift of music with the world. 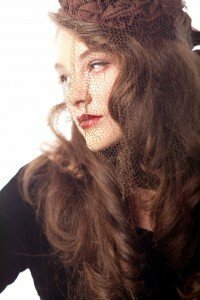 Mandy Harvey is a deaf American jazz singer and songwriter. A Vocal Music Education major at Colorado State University, Mandy lost her residual hearing in 2006-2007 at age eighteen due to a neurological disorder and left the program. She pursued several career options, including education, but returned to music in 2008. She quickly became a regular performer at Jay’s Bistro in Fort Collins and then branched to having regular concerts at Dazzle Jazz Lounge in Denver (Top 100 Jazz venues in the world). While her dream of becoming a music teacher has died, the music is still alive and well within her. Though her hearing loss is profound her timing, pitch and passion are perfect. With support from friends, family and her faith, Mandy continues to find joy in the music. If you lose hope, somehow you lose the vitality that keeps life moving, you lose that courage to be, that quality that helps you go on in spite of it all. And so today I still have a dream. -Martin Luther king Jr. 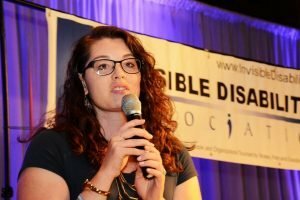 Through her struggles she became an Ambassador to the nonprofit organization No Barriers, an organization that helps individuals with disabilities and wounded warriors overcome the obstacles that they face in their day to day lives. The organization and Mandy also strive to bring education to communities to empower people to break through barriers, find their inner purpose and contribute their very best to the world. In 2011 Mandy won VSA’s International Young Soloist Award and has performed at the Kennedy Center in DC several times. Her 2013 performance was with pianist Jon Parker. Mandy’s award was presented at the 2015 Awards Gala on October 23rd, 2015. Mandy retired as an IDA Ambassador in 2017 to increase her focus on her career in music when she got word she would be on America’s Got Talent. In addition, she headlined IDA’s 9th Annual Awards Gala, Jazzed About You in October 2016 in Denver, joined by her incredible 4 piece band. On June 6, 2017, Mandy Harvey’s audition aired on America’s Got Talent on NBC!